In the picture, the vulture is waiting for the girl to die so that it can eat her. 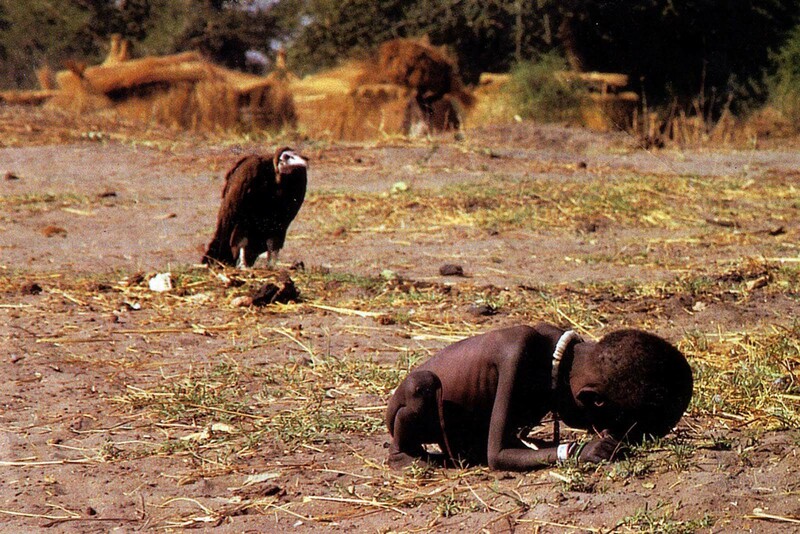 The vulture and the little girl is a photograph that was taken by a South African photojournalist, Kevin Carter, while on assignment to Sudan. “The parents of the children were busy taking food from the plane, so they had left their children only briefly while they collected the food. This was the situation for the girl in the photo taken by Carter. A vulture landed behind the girl. To get the two in focus, Carter approached the scene very slowly so as not to scare the vulture away and took a photo from approximately 10 meters. He took a few more photos before chasing the bird away”. The Vulture and The Little Girl won the Pulitzer Prize for Feature Photography award in 1994 and was chosen as Picture of the Year by The American Magazine. Carter faced a lot of criticism for clicking this picture, “The St. Petersburg Times in Florida wrote: “The man adjusting his lens to take just the right frame of her suffering, might just as well be a predator, another vulture on the scene”. “I am haunted by the vivid memories of killings and corpses and anger and pain… of starving or wounded children, of trigger-happy madmen, often police, of killer executioners… I have gone to join Ken [recently deceased colleague Ken Oosterbroek] if I am that lucky”.